Mrs. Clara Coleman Harris, ‘known as the Fried Pie Lady’, of Waco passed away Wednesday, October 10, 2018 at her residence. 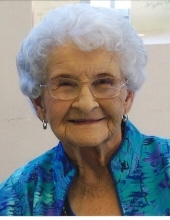 She was born in Haralson County, May 28, 1919, daughter of the late Quinn Coleman and Bithey Ayers Coleman. She was a member of the Union United Methodist Church and was the owner of a grocery store located in the Jake Community. She was an employee of Hubbard Company, Sewell Manufacturing Company and Turner Manufacturing Company. In addition to her parents, she is preceded in death by her husband, Floyd C. Harris; a daughter, Linda Sue Driver; two granddaughters, Elizabeth Ann Thomas, Whitney Ann Carter; a son-in-law, Charles Rickard Thomas; two sisters, Minnie Rose Chandler, Jewell Johnson and four brothers, Jack Coleman, Mallie Coleman, Melvin Coleman and Quinmon Coleman. Survivors include two daughters, Judy and Robert Evans of Waco, Barbara Thomas of Waco and two sons, Cecil and Sandy Harris of Temple and Tony and Lisa Harris of Dallas; grandchildren, Kim Brannon (Brad), Kay Gann (Troy), Rebecca Mohandiss (Ramsey), Mary Mandell (Rich), Tim Thomas (Andrea), Emily Springer, Lori Evans (Joe Fuller), Casie Hembree (John), Crystal Lovvorn (Andrew), Amy Bennett, Emily Thompson, Jacob Thompson (Sabrina), Luke Harris and Joel Carter and great grandchildren, Lauren Brannon (Scott), Kelsie Daniel (John), Morgan Gann, Molly Gann, Makenna Gann, Matthew Mohandiss, Claire Mohandiss, Thomas Mandell, Joshua Mandell, Hannah Thomas, Harrison Thomas, Charlie Thomas, Avery Springer, Jacie Fuller, Jett Fuller, Jackson Fuller and Alyssa Fuller, Anderson Hembree, Carson Hembree, Katelyn Hembree, Lily Lovvorn, Lyndi Lovvorn, Piper Bennett, Riley Bennett, Gatlin Thompson, Tucker Thompson and Kade Thompson. The family will receive friends at the funeral home Saturday from 1 until 3 and 5 until 8 PM. Services will be Sunday, October 14 at 2:00 PM from the Arbor at Union Campground with Reverend Herbert Butler, Reverend Britt Madden, Reverend Tony Toth and Cecil Harris officiating. Mrs. Harris will lay in state at the Arbor from 1:00 until 2:00 PM. Music will be furnished by Harold McWhorter. Alan Eidson, Tony Dinning, Buck Norton, Luke Harris, Joel Carter and Matthew Mohandiss will serve as pallbearers. Interment will follow in Five Points Church Cemetery with Reverend Tony Toth officiating. Share your thoughts and memories in the guestbook at wwwhightowerfuneralhome.com . To plant a tree in memory of Clara Coleman Harris, please visit our Tribute Store. "Email Address" would like to share the life celebration of Clara Coleman Harris. Click on the "link" to go to share a favorite memory or leave a condolence message for the family.